This past Friday he decided to go out with friends and he came back yesterday 7pm. I didn’t manage to take all this and decided to leave him today but I don’t regret my decision….did I do wrong or right by leaving him? You made the right decision. Think about your definition of a loving relationship and then think about what you have been putting up with. He won’t change but you can get out, build up your self-esteem, recognise and refuse to put up with bad behaviour and have a much better life than if you had stayed. My husband has done all of the above and still continues. We have been married 42yrs and it only gets worse. He thinks he’s entitled he cheats lies I can’t believe a word he says. He has been seeing a girl 22yrs younger them him for 5 yrs and has given her thousands of or savings. Why do I stay I’m scared and.hopeless. Your not scared lnd hopeless. He’s just brainwashed you in thinking u carnt do without him. Wipe the money out of bank and go. Would I love to have a conversation with you! This sounds exactly like my life for the past 4 years as well. The only people who can truly understand are those who have been through it. Seriously would love to talk with you. You did the exact right thing for yourself! First off…you are an amazing woman and so strong and brave for leaving the situation! You have done absolutely nothing wrong! I encourage you to stay away from him and not go back. Be aware he is going to try and tell you things you want to hear and make promises to you in order to get you back, but trust me they are all lies. He is going to be nice and sweet and when you do not respond to him or give him what he wants he is going to get angry and lash out with words to make you feel guilty and hurt. Stay strong and know you are not what he attempts to make you out to be. He is the problem not you and no matter what you do he will never change! It’s going to be a roller coaster ride with his attitude. Honestly the best thing you can do is too cut off all contact with him and do not allow him to get to you. Even if he says something to you that makes you angry or upset and you know it’s not true DO NOT respond. Narcissists feed off your emotions. Dont allow that. Get your head clear of his words and actions and get yourself back. Meaning find that girl you once were before you met him and pick up your life and move on. I left my narcissist 9 times before I figured out it wasnt me. Inargyes with him. He made promises I believed and it only always got worse, but now I have been happily gone for 5 years this year. Thank God!! I left with nothing but my children and clothes on our backs. I had no job and he had isolated me from family and friends by making me think they were the problem and or making me think they were on his side. LoL they were never on his side. Your family will hopefully support you but if not just know you are strong enough to stay away and move forward and be the anything you set your mind to be!! And also remember you are beautiful and you will one day find a man who will love you and treat you the way you deserve to be treated. You will get happier and stronger the longer you stay away from him. Stay strong my friend. AMEN to all the above. Mine did something I could never do and that was file for divorce. I wouldn’t have left him. Reasons “I always see the good in him and settled for the bad”. I’m hurt and broken but grateful he did what I couldn’t. Rebuild now and never look back. If a divorce is in the future please know it will be ugly before good. However, your best good is you no longer have to live his life and can finally take care of you. Leaving and going no contact is the best action, you will need to heal. I found healing in books written by Author HG Tudor, by reading I learned “why”? I learned why I was a target, understand the abuser which encouraged my healing. I joined a Domestic Violence support group and most of all I relied on my faith, my spiritual life. I was married to a Narcissist for too long. 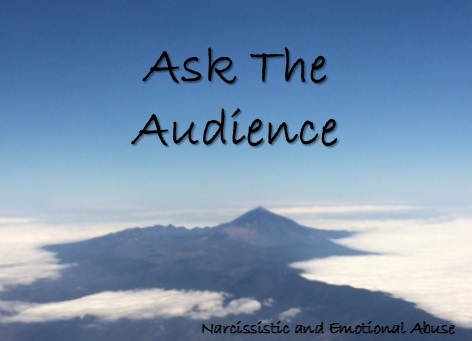 The emotional abuse is exhausting…and strangely painful and numbing all at the same time. YOU ARE WORTH AND DESERVE BETTER. Stop Spinning, Start Breathing – Narcissist Abuse Recovery. My current husband was also married to a Narcissist. Before we married, we studied that book together and learned so much. And we’ve made a wonderful, respectful, loving, and giving marriage. SO THERE IS HOPE! Remember, you can’t find the true love of your life while compromising with someone who doesn’t deserve you. Learn, heal, and grow to be the woman you are meant to be. If you have left him, you are showing the respect for yourself that he is not showing you. “Abuse and respect are diametric opposites: You do not respect someone whom you abuse, and you do not abuse someone whom you respect.” This comes from this book this gentleman below wrote, I HIGHLY recommend it! Love is very dependent on Honesty and Respect. By your description, he offers neither, thus, he does not love you. How he treats you, IS how he feels about you. He is NOT worthy of EVER hearing from you again. It is my urgent and strong recommendation that you BLOCK him on every avenue he might have with you.